Humboldt State University Library seeks a creative, collaborative, and enthusiastic Special Collections Instruction Librarian. The successful candidate will design hands-on instruction incorporating primary source material into course curricula from a variety of disciplines, with additional support for the Native American Studies and History departments. Included in this work is some collection processing during off-peak instruction time. This temporary 10-month position carries faculty rank. Early career applicants are encouraged to apply. Please view the Job Description: Library (Pool Job #7227) for complete details about the duties of the position. HSU Library offers opportunities to be creative in instruction and programming, and encourages librarians to develop projects related to their individual goals. Check out our Annual Report to learn how the Library is fostering and supporting scholarship, creativity, and innovation on campus. On March 1, 2018, the Special Collections moved to a beautiful new reading room designed to support instruction and digitization projects. 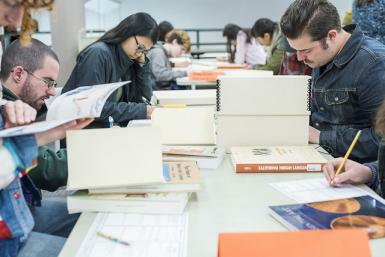 This is a great opportunity to be part of a team of librarians, interns, and students dedicated to sharing collections related to northwestern California. First review of applications will begin on May 14th and will be accepted until the position closes. The anticipated start date is August 1, 2018.